Just learned about this juicy little hack.... this will make me a gear setup specialist! The crush sleeves in the stock axles are some of the hardest I have ever encountered. I had to buy special tools to run them down. Other than that they make a solid shim kit that replaces the crush sleeve and I prefer to use them in lieu of. Besides that you need a bevy of other specialty tools. If you don't have them I wouldn't even attempt it. Yeah that's what I'm looking at... looks like a dial indicator, a dial inch-pound torque wrench, and I will take carriers and pinions to a shop and have them press the bearings on. My biggest question is how do I set the initial pinion depth. By preload? Or torque required to turn the pinion alone? Should be about 20-30 foot pounds I believe? So If I'm in that spec then the pinion depth is correct? Other than this question I feel I'm ready. Any other tools? You do all your setup at pinion preload spec which is that 20-30 number, except it's inch pounds not foot pounds. Do all setup without the crush sleeve, or if you use eliminators there's no need to even put in the eliminators. That stuff only goes in for the final installation, during setup you'll hit pinion preload with practically no torque on the pinion nut because there's no sleeve/eliminator in there so it's really easy to repeatedly get everything installed for setup. You setup pinion depth by gear pattern, and you test it at pinion preload spec which is set without the carrier just the pinion by itself. Turn your old bearings into setup bearings, and do all your setup that way. A shop can definitely do your carrier bearings because the shims are on the outside so you only have to put them on once. The pinion bearing is a bit more tricky. You do all your setup, but then when you actually press on your new bearing I found that the shim had to change by about 5 thou (presumably the bearing dimensions are ever so slightly different, or just the act of pressing them on compressed everything a bit more than I could with setup bearings), so I had to remove the new bearing to change out the shim stack and press it on again. Might be a few trips to the shop. Honestly the 20 ton Harbor Freight press is not a bad buy, did all this with ease and is a decent tool to have around. Regarding crush sleeves, one advantage is that by the time you get that nut on to 500ft-lbs+ with loctite it's never going to loosen up, and a loosening pinion nut is a disaster. Crush sleeve eliminators allow you to use small amounts of torque, which is convenient, but make sure it's enough to hold it on and use plenty of thread locker! 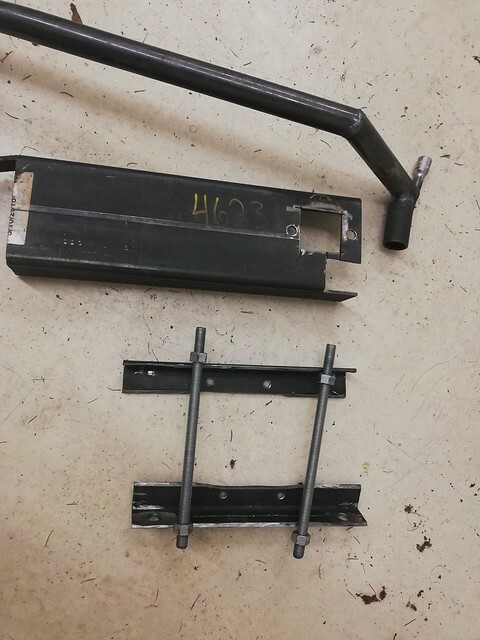 I was able to do the rear crush sleeve with an impact, but the front was much harder and I had to weld a socket to a 5 foot steel tube to get it to crush (1/2" heads just sheared off before it crushed). Yeap... I can see those 1/2" drives shearing off. I saw a neat video of a guy pressing the crush sleeve down to almost no play on the pinion then finishing the torque in a vice. Sounded like a really good hack. I am not excited about so many times pulling that bearing off and on. For the eliminator; I can see myself tack welding the pinion nut onto the pinion hahaha! Ok; I will be buying a press to do this job, I found one for a couple hundred. I will also be doing the rear crush sleeve at least, hopefully. I say hopefully be0cause if I mess up.the rear crush sleeve I'll be waiting for the eliminator set in the mail. So! If I get the rear set up and cant get the front (for whatever reason) can I pull the front DS and run my jeep on rear wheel alone with the new 4.56s? ( 35s is enough for now, since I will be adept at doing gears I can upgrade in the future!!) Until I got the parts in the mail? Last edited by libordemise; 04-07-2019 at 09:56 AM. I got this. Previous post was dumb. Last edited by libordemise; 04-14-2019 at 12:28 PM. Ok; you ready for this?? So if I take my caliper and measure the head of the new 4.56 pinion, the old 3.21 pinion, and the shim stack of the old pinion, would I not have a feasible mathematical starting point for the correct shim stack first time? This would be relative to the size difference of the new ring gear vs the old as well, so; I would measure the total amount from inside bearing to tip of the pinion and take the measurement from the carrier housing to the furthest point on the ring gear and mathematically equalize the numbers and have the correct setup first shot?!? The backlash and preload don't sufficiently constrain the system, you could have any carrier shim set and still setup preload and backlash and have a completely wrong pattern. If you're asking that question as well as where the shims go, most people would say you shouldn't do your own gears which I think is a bit harsh. So instead I'll say step back and read a lot before you proceed. You should pull your old pinion and measure the shim and start with that shim size. It's probably pretty close. Shims setup to match housing imperfections not so much gears which are much higher precision. Yes you can run in 2WD, and in fact you don't even have to pull the front drive shaft as long as you keep the transfer case in 2WD (but if you forget and switch into 4WD on the highway your whole drive train will instantly grenade, so if you think you might forget pull the drive shaft). Yeah I did a lot of reading since that post and watched multiple videos so I understand your point. It was an uninformed question. Call it stupid even. I'm now getting the tools together, it would be nice if you could simply adjust the depths and backlash by subtracting the same number from the pinion shims as the carriers haha, if the pattern was good and you could run it it would make gears easy for most to replace. Thanks! You've always given me great advice, you may not have noticed I've always followed it!! The questions you are asking tell me that you really don't know what you are getting into. This is one of those jobs that watching YouTube videos and reading threads on the internet will only get you so far. You need experience or someone close by that has it to guide you. The pattern is everything when setting up gears. At the same time have to respect the particulars like backlash and preload. I hope this isn't your daily driver because it will be down for a while as you experiment with this project. Begs the question for the front gears break in period; if its spooling will it get hot enough to properly break in or do the fronts need to be engaged? Last edited by libordemise; 04-15-2019 at 05:18 PM. Not sure what you have access to on fab tools. If you can cut, drill and weld steel you can make all these tools for next to nothing out of scrap steel. Here's the crush-wrench, flange wrench, and case spreader I made all out of scraps (plus a sacrificial pinion nut socket since the 1/2" adapter just sheared off). With a breaker bar like this welded to a socket you can crush sleeves without breaking a sweat. Regarding front break in, people have different views on that. Some people pull the rear shaft and drive around in 4Hi. I just made sure to spend at least a little time on a gravel road in 4Hi. I'm hesitant to use a case spreader and just feel if I really pack the shims tight I will have carrier preload? I wouldnt wanna pull this thing around on a dana 30 alone!! In my opinion and experience, you won't get anywhere near real preload spec without a case spreader. You can probably pack in enough to make it work but it'd be marginal (and extraordinarily difficult to get them in). It's really hard to get regear shims in because it's a stack of shims some of which are the thickness of a thick piece of paper. It's not like the stock one-piece shims which are very easy to get in since they're a single solid piece. Last edited by libordemise; 04-15-2019 at 09:02 PM. Just use a hi-lift to spread 'er open like one of KOWBOY's midgets on payday. No definitely not the bearing caps that'd probably be a bit of a disaster, it bolts to the cover bolt holes in the housing, 2 on each side. It doesn't spread nearly as much as a real case spreader, but I got I think 5-10 mils out of it which is enough to work some good shim stacks in. The thing is you're going to have to tweak the shims to within a few thou, so you're going to end up with a few very thin corrections. The people who put the shim kits together seem slightly mathematically challenged, but for the most part get it right, really they should send out 1, 2, 4, 8, 16, 32, 64, ... mil then you can get any thickness you want to within 1 mil, with as few thin shims as possible, with a kit that contains the fewest total number of shims. The factory presumably has a set of every single shim thickness (60, 61, 62, 63, 64, 65, ... mil) which would be tremendously cost prohibitive to have in a home kit, but for a factory the cost of stocking all the parts is nothing and it allows them to have a single shim per side for easy installation and servicing. Well now setting the new backlash sounds a bit more intimidating. I can see it taking several attempts as opposed to 2. So........ if one over crushed a sleeve slightly, could that person not add a shim behind to the sleeve and regain some lost thousandths?? I guess probably technically... I wouldn't bother, just buy a new crush sleeve and do it right. Backlash may take a few tries, but each try is very easy. The shims are outside the bearings so all you do is pull out the carrier and move shims around. You can set it up with reduced shim width on each side, for example remove 5 thou from each side and the backlash is the same but the shims are easy to get in, then add the thickness back in for preload on the final installation. Verify it's still right but it should be the same. Actually... with the Ls bolted to the housing... I would do that, except i dont have a hi lift. I've seen photos of people doing that. Always assumed it was a joke. Since you are going to all this trouble, you should take a bunch of photos and document what you're doing so you can build a cool how-to thread. Actually... since I will have the tools I think I will set up a gears and differentials side job. I'm sure a looot of people around my area would like to save money on their biggest mod. Last edited by libordemise; 04-18-2019 at 12:21 PM.